As one of the counties that is richest in breathtaking attractions, Hampshire will satisfy all tastes and team away day briefs. Birthplace to literary royalty like Jane Austen and Charles Dickens, historic home of King Arthur and his famed round table and blessed with the rich natural beauty of the New Forest, Hampshire is a spellbinding setting on the southern coast of England. A plethora of castles and forts built during Henry VIII’s reign overlook sailing havens such as Portsmouth, Southampton and Cowes. Hampshire’s county town, the ancient capital of England, is the breathtaking Winchester. Its cathedral is the second longest building in Europe and features architecture dating from the 11th to the 16th century. Why not explore it all on one of our fun filled treasure hunts and see what else you can discover! Fill in a quick online enquiry form or give our sales team a call on 0845 006 06 06 and see what Hampshire has to offer your next away day. You can also use our free venue finding service to find the best spot for an overnight stay or a two day conference. The Elvetham is a stunning 19th Century Mansion just 35 miles from London in the Hampshire countryside. Rich in history, the hotel retains much of its Victorian character and ambiance whilst offering a wide variety of modern amenities perfect for a team away day in Hampshire. Built in the 1880s as a private home, Audleys Wood Hotel offers 72 bedrooms and varied meeting and conference spaces. The new Garden Pavilion provides a unique setting for up to 200 guests with a private patio and garden area; ideal for breakout space or barbecues. Set deep in the New Forest, Rhinefield House was built in 1887 and is a beautiful mix of Tudor and Gothic design. 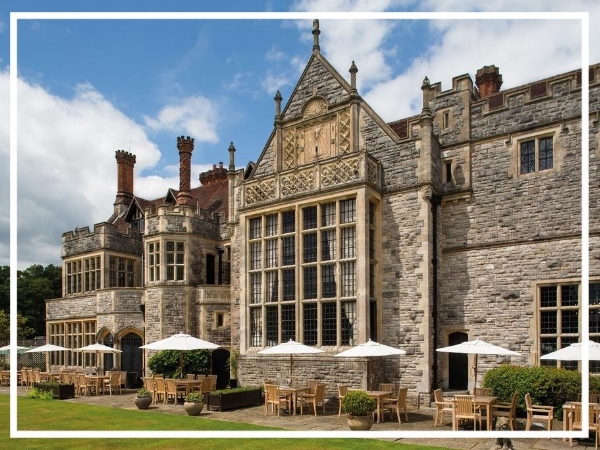 An ideal choice for a team build in Hampshire, the hotel has an award-winning fine dining restaurant, treatment rooms and both indoor and outdoor pools.